As he walks though the doors of the department store, I can see how lost he looks. I'm watching from the second floor, looking down on him as if he were a small cat in a pet shop display. He's talking on his cell phone, trying to make out my instructions for the exact place he's supposed to stand over the sound of chattering shoppers. Beside an empty overstuffed leather chair he pauses, looks around in dread. Do I really mean for him to kneel here? I can see how humiliating it is for such a proud creature to get on his knees in a public place. Yes, I say. Right There. Eyes Down. Wait. Tak tak tak tak. I approach across the polished floor and sit in the chair beside him. 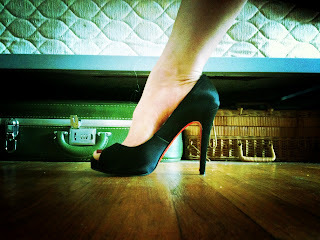 The first thing he sees are my Louboutin heels. I watch his heart jump as his eyes flick up just to my knees. No Further, I say. Not Yet. A quick study, he learns to use the correct of address, proper placement when walking, how to respond to questions. By himself he even figures out how to relax into submission by focusing on the middle distance. He never says no to me. It Is Not A Part Of Your Vocabulary, I tell him. Pressing the side of his face to the hardwood floor, his lips are soft against the satin heels. He brushes them back and forth, savours the texture like a favourite wine while he looks up the thousand miles from heel to arch to ankle to calf to thigh and eventually my smile. He has pleased me today.